For the wider local government district, see City of Carlisle. For other uses, see Carlisle (disambiguation). Carlisle (/kɑːrˈlaɪl/ or local /ˈkɑːrlaɪl/ from Cumbric: Caer Luel Scottish Gaelic: Cathair Luail) is a city and the county town of Cumbria. Historically in Cumberland, it is also the administrative centre of the City of Carlisle district in North West England. Carlisle is located at the confluence of the rivers Eden, Caldew and Petteril, 10 miles (16 km) south of the Scottish border. It is the largest settlement in the county of Cumbria, and serves as the administrative centre for both Carlisle City Council and Cumbria County Council. At the time of the 2001 census, the population of Carlisle was 71,773, with 100,734 living in the wider city. Ten years later, at the 2011 census, the city's population had risen to 75,306, with 107,524 in the wider city. What is known of the ancient history of Carlisle is derived mainly from archaeological evidence and the works of the Roman historian Tacitus. The earliest recorded inhabitants were the Carvetii tribe of Britons who made up the main population of ancient Cumbria and North Lancashire. According to Boethius and John of Fordun, Carlisle existed before the arrival of the Romans in Britain and was one of the strongest British towns at the time. In the time of the emperor Nero, it was said to have burned down. The Roman settlement was named Luguvalium, based on a native name that has been reconstructed as Brittonic *Luguwaljon, "[city] of Luguwalos", a masculine Celtic given name meaning "strength of Lugus". Excavations undertaken along Annetwell Street in the 1970s dated the Roman timber fort constructed at the site of present Carlisle Castle to the winter of AD 73, protecting a strategic location overlooking the confluence of the Caldew and Eden rivers. This walled civitas, possibly the only one in northwest Britain, presumably served as the tribal centre of the Carvetii on the model of other such sites in Roman Britain. General Gnaeus Julius Agricola advances through Carlisle in AD 79. In the year 79, the two Roman generals Cn. Julius Agricola and Q. Petillius Cerealis advanced through Solway as they continued their campaign further north. As a result, it is likely that greater control was achieved at Carlisle over anti-imperial groups. This is possibly indicated from the reconstruction of the fort at Carlisle in 83 using oak timbers from further afield, rather than local alder. At this time the Roman fort was garrisoned by a 500-strong cavalry regiment, the Ala Gallorum Sebosiana. By the early 2nd century, Carlisle was established as a prominent stronghold. The 'Stanegate' frontier, which consisted of Luguvalium and several other forts in a line east to Corbridge, was proving a more stable frontier against the Picts than those established deeper into Caledonia. In 122, the province was visited by Hadrian, who approved a plan to build a wall the length of the frontier. A new fort, Petriana, was built at Carlisle in the Stanwix area of the city north of the river. It was the largest fort along the length of Hadrian's Wall and was completed in stone by around 130. Like Luguvalium, which lay within sight, Petriana housed a 1,000-strong cavalry regiment, the Ala Petriana, the sole regiment of this size along the wall. Hadrian's successor Antoninus Pius abandoned the frontier and attempted to move further north; he built the Antonine Wall between the firths of Forth and Clyde. It was not a success and, after 20 years, the garrisons returned to Hadrian's Wall. Until the year 400, the Roman occupation fluctuated in importance. At one time, it broke off from Rome when Marcus Carausius assumed power over the territory. He was assassinated and suffered Damnatio Memoriae, but a surviving reference to him has been uncovered in Carlisle. Coins excavated in the area suggest that Romans remained in Carlisle until the reign of Emperor Valentinian II from 375 to 392. Carlisle Castle was built in the reign of William II. The period of late antiquity after Roman rule saw Cumbria organised as the native British kingdom of Rheged. It is likely that the kingdom took its name from a major stronghold within it; this has been suggested to have been broadly coterminous with the Civitas Carvetiorum, Carlisle. King Urien and his son and successor Owain became the subjects of a great deal of Arthurian legend. Their capital has been identified as the Cair Ligualid listed by Nennius among the 28 cities of Britain, which later developed into Caer-luel. Rheged came under Northumbrian control before 730, probably by inheritance after Rienmelth, daughter of Royth and great-granddaughter of Urien, married Oswy, King of Northumbria. For the rest of the first millennium, Carlisle was an important stronghold contested by several entities who warred over the area, including the Brythonic Kingdom of Strathclyde and the Anglian kingdom of Northumbria. In 685, St Cuthbert, visiting the Queen of Northumbria in her sister's monastery at Carlisle, was taken to see the city walls and a marvellously constructed Roman fountain. By the time of the Norman conquest in 1066, Carlisle was part of Scotland. It was not recorded in the 1086 Domesday Book. This changed in 1092, when William the Conqueror's son William Rufus invaded the region and incorporated Cumberland and Carlisle into England. The construction of Carlisle Castle began in 1093 on the site of the Roman fort, south of the River Eden. The castle was rebuilt in stone in 1112, with a keep and the city walls. The walls enclosed the city south of the castle and included three gates to the west, south, and east called the Irish or Caldew Gate, the English or Botcher Gate, and the Scotch Gate respectively. The names of the gates exist in road names in Carlisle today. Carlisle Cathedral was built in 1133. The conquest of Cumberland was the beginning of a war between Scotland and England which saw the region centred around Carlisle change hands a number of times. It was a major stronghold after the construction of the castle. During the wars, the livelihood of the people on the borders was devastated by armies from both sides. Even when the countries were not at war, tension remained high, and royal authority in one or the other kingdom was often weak. The uncertainty of existence meant that communities or peoples kindred to each other sought security through their own strength and cunning, and they improved their livelihoods at their enemies' expense. These peoples were known as the Border Reivers and Carlisle was the major city within their territories. The Reivers became so much of a nuisance to the Scottish and English governments that, in 1525, the Archbishop of Glasgow Gavin Dunbar cursed all the reivers of the borderlands. The curse was detailed in 1,069 words, beginning: "I curse their head and all the hairs of their head; I curse their face, their brain (innermost thoughts), their mouth, their nose, their tongue, their teeth, their forehead, their shoulders, their breast, their heart, their stomach, their back, their womb, their arms, their leggs, their hands, their feet and every part of their body, from the top of their head to the soles of their feet, before and behind, within and without." After the Pilgrimage of Grace, Henry VIII, concerned at the weakness of his hold on the North, employed (1539) the engineer Stefan von Haschenperg to modernise the defences of Carlisle. von Haschenperg was sacked in 1543 for having "spent great treasures to no purpose"; but (by him and his successors) at the north end the castle towers were converted to artillery platforms, at the south the mediaeval Bochard gate was converted into the Citadel, an artillery fortification with two massive artillery towers. :243 The death of Queen Elizabeth I in 1603 and her succession by James VI of Scotland as King James I of England allowed more determined and coordinated efforts to suppress reiving. The borderers were not quick to change their ways and many were hanged and whole families were exiled to Ireland. It was not until 1681 that the problem of the reivers was acknowledged as no longer an issue. Following the personal union of the crowns Carlisle Castle should have become obsolete as a frontier fortress, but the two kingdoms continued as separate states. In 1639, with war between the two kingdoms looming, the castle was refortified using stone from the cathedral cloisters. In 1642 the English Civil War broke out and the castle was garrisoned for the king. It endured a long siege from October 1644 until June 1645 when the Royalist forces surrendered after the Battle of Naseby. The city was occupied by a parliamentary garrison, and subsequently by their Scots allies. In 1646, the Scots, now holding Carlisle pending payment of monies owed them by the English Parliament, improved its fortifications, destroying the cathedral’s nave to obtain the stone to rebuild the castle. Carlisle continued to remain a barracks thereafter. In 1698 travel writer Celia Fiennes wrote of Carlisle as having most of the trappings of a military town and was rife with alcohol and prostitutes. In 1707 an act of union was passed between England and Scotland, creating Great Britain, and Carlisle ceased to be a frontier town. Carlisle remained a garrison town. The tenth, and most recent siege in the city's history took place after Charles Edward Stuart took Carlisle in the Jacobite Rising of 1745. When the Jacobites retreated across the border to Scotland they left a garrison of 400 men in Carlisle Castle. Ten days later Prince William, Duke of Cumberland took the castle and executed 31 Jacobites on the streets of Carlisle. Although Carlisle continued to garrison soldiers, becoming the headquarters of the Border Regiment, the city's importance as a military town decreased as the industrial age took over. The post of Governor of Carlisle as garrison commander was abolished in 1838. In the early 19th century textile mills, engineering works and food manufacturers built factories in the city mostly in the Denton Holme, Caldewgate and Wapping suburbs in the Caldew Valley. These included Carr's of Carlisle, Kangol, Metal Box and Cowans Sheldon. Shaddon Mill, in Denton Holme, became famous for having the worlds 8th tallest chimney and was the largest cotton mill in England. The expanding industries brought about an increase in population as jobs shifted from rural farms towards the cities. This produced a housing shortage where at one point 25,000 people in the city only had 5,000 houses to live in. People were said to be herded together with animal houses, slaughter houses and communal lavatories with open drains running between them. Living conditions were so bad that riots were common and some people emigrated. The problem wasn't solved until the end of the 19th century when mass housing was built west of the city walls. In 1823 a canal was built to Fisher's Cross (Port Carlisle) to transport goods produced in the city. This enabled other industrial centres such as Liverpool to link with Carlisle via the Solway. This was short-lived and when the canal operators ran into financial difficulty the waterway was filled in. A railway was built in place of the canal. Carlisle became a major railway centre on the West Coast Main Line with connections to the east. At one time seven companies used Carlisle Citadel railway station. Before the building of the Citadel railway station the city had several other railway stations, including London Road railway station. Carlisle had the largest railway marshalling yard in Europe at Kingmoor which, reduced in size, is operational and used by railfreight companies. At the start of the 20th century, the population had grown to over 45,000. Transport was improved by the City of Carlisle Electric Tramways from 1900 until 1931, and the first cinema was built in 1906. In 1912, the boundaries of Carlisle were extended to include Botcherby in the east and Stanwix in the north. Carlisle was subject to the decline in the textile industry experienced throughout Britain as new machinery made labour unnecessary. In 1916, during the First World War, the government took over the public houses and breweries in Carlisle because of drunkenness among construction and munitions workers from the munitions factory at Gretna. This experiment nationalised brewing. As the Carlisle Board of Control, and subsequently the Carlisle & District State Management Scheme, it lasted until 1971. In the 1920s and 1930s the first council houses were built in the city, many of them in the Raffles suburb to the west of the city. Initially Raffles contained the most sought after housing in the city by council tenants. In the 1990s it became infamous with high crime rates and impoverished living standards. A report from April 1994 in The Independent on Sunday branded the estate a no-go area. One resident was reported to have said "If you've got a problem in Raffles, get a shotgun". The estate was redeveloped in 2004 by replacing some housing. A shopping centre (including a new central library) was built to the east and north-east of the market cross and opened in 1986. The area east of the market cross had formerly been occupied by narrow alleyways of housing and small shops (on a layout which had not changed much since medieval times) and referred to locally as The Lanes. Carlisle city centre was pedestrianised in 1989. On the evening of Friday 7 January 2005, the rivers Eden, Caldew and Petteril burst their banks due to as much as 180 mm rainfall up stream that day. 2,700 homes were flooded and three people died. The city's police and fire stations were flooded along with Brunton Park football stadium. The police, fire service and Carlisle United F.C. were moved, the latter as far as Morecambe. At the time of the flood emergency services also had to respond to cases of car-related arson in the city. Carlisle is the only city in Cumbria. The city centre is largely pedestrianised and the Lanes shopping centre is home to around 75 stores. Carlisle has a compact historic centre with a castle, cathedral and semi-intact city walls, as well as other medieval buildings including the Guildhall and Tithe Barn. The former law courts or citadel towers which now serve as offices for Cumbria County Council were designed by Thomas Telford, with the eastern tower incorporating part of the 16th century building. The first Citadel building was a Tudor fortification replacing the medieval Englishgate, designed by the Moravian military engineer Stefan von Haschenperg in 1541. Next to the Citadel is Carlisle railway station, designed by William Tite in the neo-Tudor style, considered by Historic England to be among the most important early railway stations in England. Carlisle has held city status since the Middle Ages and a borough constituency or parliamentary borough for centuries, at one time returning two MPs. In 1835 it became a municipal borough which was promoted to county borough status in 1914. 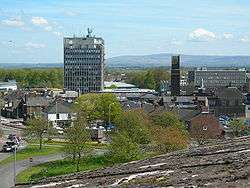 The city's boundaries have changed since 1835 the final time in 1974 when under the Local Government Act 1972 the city and county borough merged with the Border Rural District to become the new enlarged City of Carlisle, a non-metropolitan district of Cumbria. The municipal borough contained several civil parishes or parts of parishes but these were merged into a single civil parish of Carlisle in 1904. The present day urban area is classed as an unparished area except for the fringes which are in Stanwix Rural, Kingmoor and St Cuthbert Without parishes. Carlisle unsuccessfully applied to become a Lord Mayoralty in 2002. Carlisle City Council has headquarters in the 1960s Civic Centre in Rickergate. An iconic building and tallest in Carlisle, it may be demolished and the surrounding area regenerated. The current member of Parliament is John Stevenson – Conservative. Carlisle elects 12 county councillors to the Cumbria County Council. Carlisle is governed by a district council, Carlisle City Council and as of the 2015 election the Labour party has a majority on the council. The council covers a large rural area with many villages and small towns including Dalston, Brampton, Longtown, Wetheral, Bewcastle and Scotby. Carlisle is situated on a slight rise, in the Cumberland Ward, at the confluence of the rivers Eden, Caldew and Petteril. An important centre for trade, it is located 56 miles (90 km) west of Newcastle upon Tyne, 71 miles (114 km) north of Lancaster, 90 miles (140 km) south-east of Glasgow, 93 miles (150 km) south of Edinburgh, 120 miles (190 km) north-west of York, and 300 miles (480 km) north-north-west of London, at 54°52’N, 2°50’W. Nearby towns and villages include Longtown (north), Penrith (south) Brampton (east), Wigton (west), Haggbeck, Harker, Carwinley, Blackford, Houghton, Scotby, Wreay and Rockcliffe. Carlisle experiences an oceanic climate (Köppen climate classification Cfb). In January 2005 Carlisle was hit by strong gales and heavy rain, and on Saturday 8 January 2005 all roads into Carlisle were closed owing to severe flooding, the worst since 1822, which caused three deaths. Less serious but still significant flooding happened in 2009, but due to Storm Desmond, even worse flooding than 2005 badly affected Carlisle between Friday 4 and Sunday 6 December 2015. During this time, nearly 36 hours of incessant rainfall breached flood defences and left several areas submerged - including Bitts Park, Hardwicke Circus and Warwick Road. This left the famous Sands Centre (and the nearby Shell petrol station and Bitts Park), marooned from the rest of the city. As several other areas of Cumbria were also badly affected (particularly Appleby and Wigton), all trains to Scotland were postponed indefinitely, with trains on the West Coast Mainline going no further than Preston, as nearby Lancaster suffered flooding and problems with electricity supply. Prime Minister David Cameron visited the city on 7 December 2015 to assess the damage, having earlier called an emergency Cobra meeting. Warwick Road serves as one of the main routes into the centre of Carlisle. In the north of Carlisle are the suburbs of Kingstown, Lowry Hill and Moorville, formerly part of the parish of Kingmoor. To the south of them are Stanwix, Edentown, Etterby, St Ann's Hill and Belah which were added to Carlisle in 1912. The parish of Stanwix Rural exists but only includes a small part of Carlisle's urban area, Whiteclosegate. To the immediate south of Stanwix is the River Eden. On the opposite bank is the city centre bounded on the west by the West Coast Main Railway line and the River Caldew. In the past industry flourished on the banks of the River Caldew, especially Denton Holme and Caldewgate on the west bank and Wapping, around the former Metal Box works, on the east. West of Caldewgate and north of Denton Holme the suburbs of Newtown, Morton, Sandsfield Park, Longsowerby, Raffles and Belle Vue developed in the late 19th and 20th centuries. The eastern side of the city centre developed in the 19th century into a more affluent area along the main A69 road. It links with the former village of Botcherby to which a large council estate was added in the mid-20th century and later still Durranhill Housing Estate. 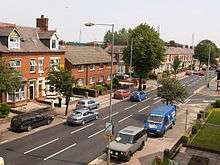 South of the city centre is the Botchergate/St Nicholas area of late Victorian terraced housing similar to that found in Denton Holme and Caldewgate. The Botchergate East area until recently had older slum dwellings. To the south west of Botchergate and St Nicholas are the former villages now suburbs of Upperby and Currock. The urban area spills over the former county borough boundary into Blackwell and Durdar in the civil parish of St Cuthbert Without. Between Upperby and Botcherby is Harraby a former village once part of St Cuthbert Without and the largest suburb of Carlisle. Harraby is subdivided into Harraby East, New Harraby, Harraby Green, Old Harraby, Petteril Bank and the Durranhill Industrial Estate. Adjoining Harraby to the south but outside the former borough boundary is the hamlet of Carleton. Carlisle is linked to the rest of England via the M6 motorway to the south, and to Scotland via the M74/A74 towards Glasgow and the north. Many trunk roads begin or terminate in Carlisle, including the A6 to Penrith and Luton (historically the main road to the south) , the A595 to western Cumbria, the A69 to Newcastle upon Tyne and the A7 to Edinburgh. The city of Carlisle is the only city in Great Britain other than London and Edinburgh with more than one single numbered 'A' road - A6 and A7 (although at one time the A5 and A6 met in St Albans). The nearest commercial airport is found in Newcastle Airport near the east coast around 55 miles (89 km) away from Carlisle. Traffic in the Carlisle area, especially at rush hour, is a significant problem and in 2012 a bypass opened to take traffic from west Cumbria heading to the M6 away from the city centre. 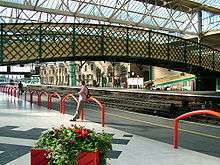 Carlisle is a principal railway station on the West Coast Main Line. Other lines go to Newcastle along the Tyne Valley Line, Leeds along the Settle and Carlisle Line, Glasgow Central via Dumfries along the Glasgow South Western Line which connects Ayr and Stranraer for the Stena Line ferry to Port of Belfast or P&O Ferries to Larne Harbour, and west Cumbria along the Cumbrian Coast Line to Whitehaven, Barrow-in-Furness and Lancaster. Kingmoor Traction Maintenance Depot is a major facility north of Carlisle. Local bus services are run by Stagecoach North West, Reay's and Arriva. Following the flooding of Carlisle Bus Depot on 8 January 2005 Stagecoach announced the purchase of a fleet of low-floor buses for Carlisle city routes. These were launched on 30 June 2005, with "Carlisle Citi" branding, and most buses carry route branding for individual routes both internally and externally. In 2009 locally based coach operator Reay's started a City Hopper bus services on routes formerly operated by Stagecoach but has since expanded with similar routes to Stagecoach and also connects parts of the city that previously did not have a service. Carlisle bus station serves the city of Carlisle, Cumbria, England. The bus station is owned and managed by the Stagecoach in Cumbria. The bus station, of seven stands and a travel centre is situated on Drury Lane just off Lonsdale Street in the city centre. The present station was built in the 1990s to replace a larger station that was partially on the same site and had access from Lowther Street where the Earls Lane shopping area is now. The main operators at the bus station are Stagecoach in Cumbria and Arriva North East. Carlisle became an industrial city in the 19th and early 20th centuries with many textile mills, engineering works and food manufacturers opening up mostly in the Denton Holme, Caldewgate and Wapping areas which lie in the Caldew Valley area of Carlisle. (One such manufacturer located in the Denton Holme area was Ferguson Printers, a large textile printing factory that had stood for many years before its unfortunate closure in the early 1990s). In the early 19th century, a canal was dug connecting Caldewgate with the sea at Port Carlisle. The canal was later filled in and became a railway line. Famous firms that were founded or had factories in Carlisle included Carr's of Carlisle (now part of United Biscuits), Kangol, Metal Box (now part of Crown Holdings) and Cowans Sheldon. Cowans Sheldon originated in the city in the mid 19th century and became one of the world's most important railway and marine engineering firms, manufacturing finally ceased in Carlisle in 1987. The Carr's and Metal Box factories are still going. The construction firm of John Laing and the hauliers Eddie Stobart Ltd. were also founded in Carlisle. Eddie Stobart Ltd., now part of the Stobart Group, still have their HQ in Carlisle and employ around 600 staff in the city. Until 2004, Carlisle's biggest employer was Cavaghan & Gray, part of Northern Foods which operated from two sites in the Harraby area of Carlisle producing chilled foods for major supermarket chains. As of January 2005, the London Road site was closed with the loss of almost 700 jobs as production was transferred to the nearby Eastern Way site or other factories around the UK. Carlisle also became a major railway centre with at one time 7 different companies using Carlisle Citadel railway station. Prior to the building of the Citadel railway station, Carlisle had several railway stations, including London Road railway station. Carlisle also used to have the largest railway marshaling yard in Europe at Kingmoor which, although reduced in size, is still very much operational and used by railfreight companies like Colas Rail Freight, Freightliner Heavy Haul, DB Schenker Rail UK (formerly EWS) and very occasionally Direct Rail Services. There are various light industrial estates and business parks located on the fringes of Carlisle and on former industrial sites close to the city centre. The largest being the Kingstown Industrial Estate, which is located just off the A7 road near to the M6 motorway. On 28 March 2005 Carlisle was granted Fairtrade City status. The University of Cumbria has four campuses in Carlisle on Fusehill Street, Brampton Road, Paternoster Row and Newcastle Street. The university provides a wide range of degree courses in higher education such as Applied Computing, Applied Psychology, Art, Business, Law, Media, Social Work and Teacher Education. Carlisle College is the further education establishment based in the town. The secondary schools within the city of Carlisle are: Richard Rose Central Academy, Richard Rose Morton Academy, Austin Friars St Monicas (Roman Catholic Private School), Trinity School, Newman Catholic School. Other secondary schools in the wider Carlisle district are: Caldew School, (Dalston) and William Howard School (Brampton). Richard Rose Central Academy replaced St Aidan's County High School and Specialist Sports and Science College, and North Cumbria Technology College (NCTC, formerly Harraby School). It is sponsored by Eddie Stobart owner Andrew Tinkler, and local businessman Brian Scowcroft. It opened in September 2008. In January 2009, there were protests by parents and pupils regarding poor quality education and school facilities. The school was found to be failing and was placed in Special Measures, with the headmaster and chief executive being immediately replaced. The Tullie House Museum and Art Gallery was opened in 1893 by the Carlisle Corporation. The museum features resident exhibits detailing the history of Roman occupancy of the region, Hadrian's Wall and the Border Reivers. 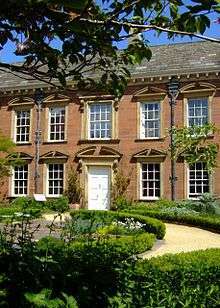 Tullie House, named after the Jacobean mansion in which it is located, hosts travelling exhibitions. The museum has received many awards and was expanded in 1990 and 2000. The city's Guildhall Museum is based in a 14th-century house and the Border Regiment Military Museum is in the castle. Sands Centre Sports Hall is Carlisle's main entertainment venue which sometimes hosts touring musicians, theatre and comedians. There has been no theatre in Carlisle since Her Majesty's Theatre in Lowther Street closed in 1963. Stanwix Arts Theatre operates in the northern suburb and West Walls Theatre, an amateur theatre. Brunton Park stadium has hosted live music including an Elton John concert in 2007. Carlisle Music Festival takes place in Carlisle Cathedral each year and the defunct Brampton Live, the largest folk festival in the north of England, formerly took place in Brampton. Over the weekend of 14/15 May 2011, Carlisle Lake District Airport hosted Europe's largest free music festival, Radio 1's Big Weekend. The festival's headline acts included Lady Gaga and the Foo Fighters. 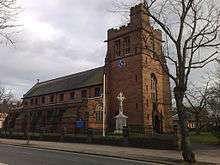 St Cuthbert's Church hosts an annual series of instrumental and chamber music concerts organised by North Cumbria Recitals. The one notable band to have origins in Carlisle is '70s rock outfit Spooky Tooth who formed from the ashes of the less successful V.I.P.s in 1967. Every August the Carlisle Food Fair is held in the pedestrianised area of the city centre. It plays host to produce from across the continent and features local produce including Cumberland sausage, Cumberland sauce and Cumberland Mustard. Cumbria has more microbreweries than any other county and supply a variety of ales to pubs and restaurants throughout Carlisle. Carlisle is approximately 25 miles north of the northern edge of the Lake District, which is home to some of Britain's best restaurants. From 1961 to 2009 Carlisle was home to Border Television which served the ITV Border region. Border TV suffered a period of decline in the range and quantity of its output after its 1970s heyday. After the closure its premises were demolished in 2010. No regular TV news programmes were made in North Cumbria from 2010 to 2014. A 15-minute news opt-out is provided by ITV Tyne Tees in Gateshead. In 2014, Border Television announced that its newsroom for the area would return to Carlisle. The Cumberland News is the local broadsheet paper published on Fridays. The News and Star is the evening paper. Both are published by Carlisle-based CN Group. In radio Carlisle is home to BBC Radio Cumbria, CFM Radio and Hospital Radio Echo, it was established in 1965 and is the hospital radio station to Cumberland Infirmary, 24 hours a day. Main article: Carlisle United F.C. Carlisle is represented in English football by Carlisle United, Currently in the fourth tier of English football after being relegated from the Football League One. The club has played at Brunton Park on Warwick Road (A69) since 1909. In November 2011 plans were unveiled for the club to move to a 12,000-seat stadium in Kingmoor Park. The club's first Football League tenure began in 1928 when it was elected to the northern section of the Football League Third Division, replacing Durham City. Its past achievements include reaching the Football League Cup semi-finals (its best run in either of the two domestic cups) in 1969, and winning promotion to the top flight (then the Football League First Division) in 1974. The club topped the English league after winning its first three games of the 1974-75 season, but failed to keep up its good form and was relegated after just one season. In 1987 the club returned to the Football League Fourth Division, and in 2004 was relegated to the Football Conference - the first former top division club to do so - only to regain their Football League place after one year. In 1999, Carlisle United escaped relegation from the Football League on the final day of the season when on-loan goalkeeper Jimmy Glass scored an injury time winner against Plymouth Argyle. The 2-1 win meant that Scarborough was relegated. Though Carlisle United has rarely attracted the national football headlines, the club has fielded high-profile players. Some have achieved fame at bigger clubs after spending their early careers at the club. These include Peter Beardsley, Stan Bowles, Steve Harkness, Matt Jansen, Rory Delap, Danny Graham. Many older players spent their later years at Carlisle United after playing for bigger clubs. These include Michael Bridges, Mervyn Day, Kevin Gray and David McCreery. Former managers include Bill Shankly, Alan Ashman, Bob Stokoe, Harry Gregg, Mick Wadsworth, Nigel Pearson and Paul Simpson. Since Workington was voted out of the Football League in 1977, Carlisle United has been the only Cumbrian team to play senior football. Main article: Celtic Nation F.C. Celtic Nation F.C. was a Carlisle-based semi-professional club who played in the Northern Football League Division One. They folded in April 2015 after a season of financial problems. Nation started out in 2004 as Gillford Park F.C. and played in the Northern Football Alliance league and won four promotions in 8 years. In 2012 Scottish millionaire Frank Lynch who is based in America, started putting money into the club and changed its name to Celtic Nation. After two years, Lynch withdrew his financial support and the club struggled before folding. Main article: Carlisle City F.C. Carlisle City are a semi professional side who play in the North West Counties Football League. After spending 40 years in the Northern Football Alliance league, they were promoted in 2016. They play at Gillford Park after taking over the lease from Celtic Nation in the summer of 2015. Northbank Carlisle is a Northern Football Alliance Premier Division side based in the city, who play at Sheepmount Athletics Stadium. Carlisle has two rugby union clubs: Carlisle RFC and Creighton RUFC. Carlisle RFC play at Warwick Road, alongside Carlisle United Football Club. Creighton RUFC originally played near Cumberland Infirmary but sold its ground to housing development company Story Homes in 2004 in exchange for new facilities off Cumwhinton Road, near Junction 42 of the M6. Former England rugby union captain Steve Borthwick is a native of Carlisle. The rugby league team, Carlisle merged with Barrow and left Carlisle. Amateur rugby league club, Carlisle Centurions play in the National Division of the Rugby League Conference. The club's ground, Gillford Park has covered accommodation on three sides and nearly 1,000 seats. Cumberland County Cricket Club play at the Edenside Ground north of the city centre. Cumberland is classed as a minor county by the ECB. The club has won the Minor Counties Championship twice. Horse racing has been held in Carlisle for centuries. In 1904 Carlisle Racecourse was established to the south of the city, it is now a first class racecourse. Carlisle has several golf clubs including Stoneyholme within the city, and Carlisle Golf Club which hosts regional qualifying to the Open Championship. 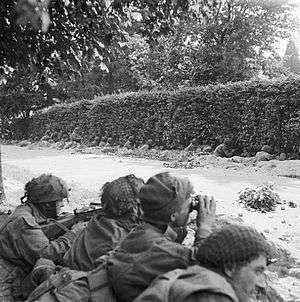 Men of C Company 1st Battalion, Border Regiment, waiting to repulse an attack by an enemy barely 100 yards away. As a frontier town for over a millennium and a half, Carlisle is a military city. It is the most besieged place in the British Isles, having been besieged at least ten times, and has garrisoned troops for most of its history. 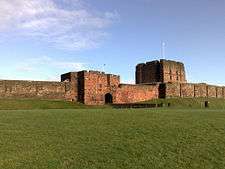 Cumbria's County regiment, the Border Regiment made its headquarters at Carlisle Castle. The regiment was amalgamated with the King's Own Royal Regiment (Lancaster) to become the King's Own Royal Border Regiment and subsequently the Duke of Lancaster's Regiment where its lineage continues. From 1720 to 1959 the regiment fought in many campaigns including the French and Indian War, the Battle of Culloden, the First World War and the Second World War. RAF Carlisle also known as 14 MU was located at Kingstown near the present-day Asda. The station closed in 1996 after nearly sixty years in a variety of roles. First established as RAF Kingstown in 1938, it was originally a bomber station, then one of the RAF's Elementary Flying Training Schools and latterly a post-war storage facility. During the Second World War the air raid warning organisation No 32 Group Carlisle Royal Observer Corps operated in the city centre controlled from RAF Kingstown. The association with Kingstown developed further in 1962 when the ROC ceased its aircraft spotting role for the RAF and took on a new role plotting nuclear explosions and warning the public of radioactive fallout for the United Kingdom Warning and Monitoring Organisation (UKWMO). A new administration building and a protected, hardened Nuclear Reporting bunker was built at RAF Carlisle. The nuclear bunker was a standard above-ground structure and both the bunker and headquarters hutting were on a separate site at Crindledyke outside the main gates of RAF Carlisle. The Carlisle group was redesignated no 22 Group ROC. The ROC constructed a smaller nuclear reporting post, Kingstown post (OS ref:NY 3837 5920), on the main RAF Carlisle site. The post was an underground protected bunker for a crew of three observers. The headquarters bunker accommodated an operational crew of around 100 with dormitory and canteen facilities an operations room and life support plant. The Royal Observer Corps was stood down and its parent organisation the UKWMO was disbanded in December 1995 after the end of the Cold War and as a result of recommendations in the governments Options for Change review of UK defence. The ROC buildings were demolished in 1996 and replaced by a cellphone communications mast. The foundations of the nuclear bunker can still be partially seen outlined in the concreted yard, which also contains the Air Training Corps hut during recent further development of the site. The Curse of Carlisle is a 16th-century curse that was first invoked by Archbishop Dunbar of Glasgow in 1525 against cross-border families, known as the Border Reivers, who lived by stealing cattle and pillage. The curse was not directly aimed at Carlisle or its people so it seems illogical that it should be called the Carlisle Curse. It is likely that the whole thing was whipped up by a cynical press. For the millennium celebrations, the local council commissioned a 14-tonne granite artwork inscribed with all 1,069 words of the curse. In 1998 some Christians, among other projects, began campaigning to prevent the city of Carlisle from installing the stone. In the wake of this controversy, a minority prone to superstition whipped up a furore about the stone. They blamed a number of the city's setbacks on the curse stone, including an outbreak of foot-and-mouth disease, a flood, various crimes, rising unemployment statistics and even the fate of Carlisle United, which was relegated out of its league. Most Carlisle and Cumbria citizens attached no credibility to this notion. The City Council shared their scepticism. 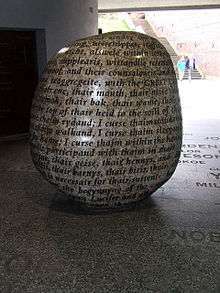 In March 2005, Liberal Democrat city councillor Jim Tootle, on the request of a Christian citizen, proposed the stone either be moved outside the city boundaries or destroyed altogether. Kevin Carlyon, the self-titled "high priest of the British white witches" and the "Living God of all Witches" but only in his own and very singular opinion, proclaimed that such actions would give the curse more power. He commented that: "A curse can only work if people believe in it. I think at the moment the sculpture is a nice piece of history, but if the council destroys it, they would be showing their belief in the curse." A council meeting on 8 March 2005 rejected Tootle's proposal, a move welcomed by council leader Mike Mitchelson, who had earlier questioned whether moving the stone was a good use of council funds. ↑ "List of railway station names in English, Scots and Gaelic". Newsnetscotland.com. Archived from the original on 22 January 2013. Retrieved 14 November 2012. ↑ Landranger 85: Carlisle & Solway Firth. Ordnance Survey. 2007. ISBN 978-0-319-22822-7. ↑ "Carlisle Facts". 7 September 2013. Retrieved 12 October 2013. ↑ "News & Star | News | Carlisle council leader says it's time to ditch 'Great Border City' tag". www.newsandstar.co.uk. Archived from the original on 11 December 2015. Retrieved 15 October 2015. ↑ Samuel Sampson (1746). The Agreeable Historian, or the Complete English Traveller. ↑ John of Fordun, Chronicle of the Scottish Nation, Edinburgh, Edmonston and Douglas (1872), p. 52. In The Historians of Scotland, vol. IV. ↑ Jackson, Kenneth (1953). Language and History in Early Britain. Edinbugh, UK: Edinburdh University Press. p. 39. ISBN 1-85182-140-6. 1 2 "Tullie House". iRomans, a Tullie House website. Retrieved 3 May 2011. ↑ David Shotter. "Cerialis, Agricola and the Conquest of Northern Britain". Council for British Archaeology. Retrieved 3 May 2011. 1 2 "Timeline of Roman Carlisle". Tullie House Museum. Retrieved 3 May 2011. ↑ Higham, Nick (1986). The Northern Counties to AD 1000. Longman Higher Education. ↑ John T. Koch (16 December 2005). Celtic Culture : A Historical Encyclopedia. ABC-CLIO. ↑ Bede. "The Life and Miracles of St. Cuthbert, Bishop of Lindisfarne". Internet History Sourcebook. Fordham University: The Jesuit University of New York. Retrieved 27 November 2015. ↑ "The Border Reivers - The Curse". BBC Cumbria. Retrieved 4 May 2011. 1 2 Hyde, Matthew; Pevsner, Nikolaus (2010). The Buildings of England: Cumbria; Cumberland, Westmorland and Furness. London: Yale University Press. ISBN 978 0 300 12663 1. ↑ Sadler, John (2004). 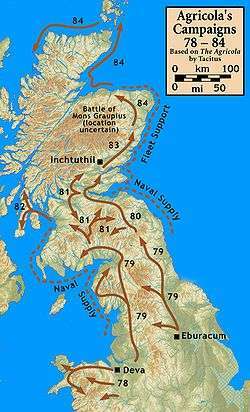 Border Fury: England and Scotland at War, 1296 - 1568. Longman. 1 2 Nanson, W (1884). Carlisle during the siege of 1644–5. old ser. 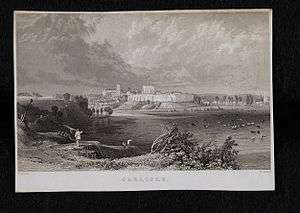 "Carlisle Castle during the civil war". English Heritage. Retrieved 4 May 2011. ↑ Fiennes, Celia (2009). Through England on a Side Saddle. Penguin Classics. ↑ Accounts and Papers: Seventeen Volumes. UK Government. 1838. p. 58. ↑ "Carlisle - History". EDGE Guide. Retrieved 3 May 2011. ↑ "Port Carlisle". Visit Cumbria. Retrieved 3 May 2011. 1 2 "A History of Carlisle". Local histories. Retrieved 4 May 2010. ↑ "The Raffles Estate: Then and Now". BBC Cumbria. BBC. 13 November 2009. Retrieved 4 May 2011. ↑ "No-Go Britain: Where, what, why". The Independent on Sunday. London: Independent Newspapers Ltd. 17 April 1994. Retrieved 4 May 2011. ↑ Legg, Matthew (17 February 2009). "New homes for rent on Carlisle's Raffles estate". Cumberland News. Retrieved 12 June 2010. ↑ Scott Parker, Mary Scott (November 2006). Memories of the Lanes. Bookcase. ↑ "Carlisle Floods January 2005". Met office. Retrieved 25 April 2011. ↑ Bernard Dolan (14 January 2005). "Message from, Bernard Dolan, to staff". Cumbria Fire & Rescue Service. Retrieved 4 May 2010. ↑ Colvin, Howard, ed., The History of the King's Works, vol. 4 part 2, (1982), 670-1. ↑ County councillors Archived 28 April 2009 at the Wayback Machine. ↑ "Carlisle City Council Elections -2015". Carlisle City Council. Retrieved 8 May 2015. ↑ "Carlisle 'cut off' by flood water". BBC News. 8 January 2005. Retrieved 31 December 2009. ↑ "Carlisle climate normals 1981-2010". Met Office. Retrieved 20 August 2016. ↑ "Ofsted inspection report, Richard Rose Central Academy" (PDF). Retrieved 9 February 2009. ↑ "Richard Rose Central Academy: Press Release". Retrieved 9 February 2009. ↑ "History of Tullie House". Tullie House. Archived from the original on 30 September 2011. Retrieved 4 May 2011. ↑ "Blues army for Elton at Brunton Park". Cumberland News. 8 June 2007. Retrieved 25 April 2011. ↑ "Olympic torch relay to stop in Carlisle and Bowness". BBC News. 18 May 2011. Retrieved 20 May 2011. ↑ "Carlisle Castle History and Research". English heritage. Retrieved 5 May 2011. ↑ A Short History of the Border Regiment (6th ed.). Gale and Polden Ltd. 1944. ↑ Kevin Carlyon's website kevincarlyon.com. ↑ BBC News (8 March 2005). "Witch warns of Curse Stone power". Retrieved 31 December 2009. "Carlisle", Encyclopædia Britannica, 9th ed., Vol. V, New York: Charles Scribner's Sons, 1878, pp. 108–110 . "Carlisle", Encyclopædia Britannica, 11th ed., Vol. V, Cambridge: Cambridge University Press, 1911, p. 341–2 . Wikimedia Commons has media related to Carlisle, Cumbria.